Acne and Pimples have started showing up again on my somewhat acne prone skin since summer and since then I have been trying all different products be it Votre Skincare Products for Acne or this Iraya gel for acne skin. 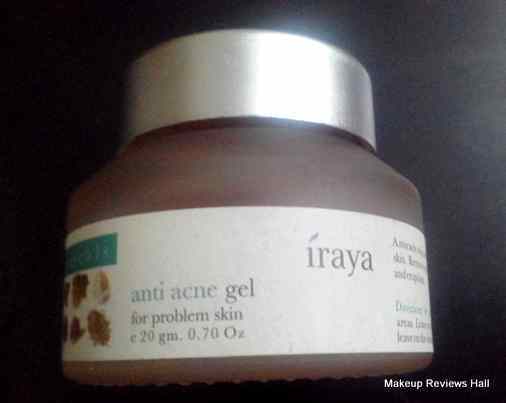 This is a review on this IRAYA ANTI ACNE GEL which I got in my April Fab Bag. 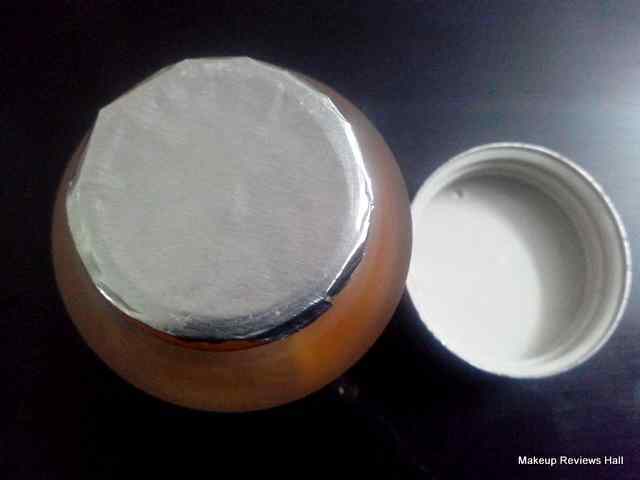 The best thing I like about this anti acne gel at first look was its packaging. I know most of the people don't like these type of jar packaging since its bit messy and unhygienic but it looked very cute on a first look and comes in a small jar being travel friendly too. Take a look at this cute looking frosty jar from Iraya. Solution for pimples, blackheads and problematic skin. After cleansing, apply to problem areas. Leave on for 20 minutes. Wash off. If required leave on the whole night. Coriander (Coriandrum Sativum), Lodh Tree Bark (Symplocos Racemosa), Sweet Flag (Acorus Calamus), Sea Salt (Sodium Chloride), White Mustard(Brassica Alba), Turmeric (Curcuma Longa), Nutgrass (Cyperus Rotundus), Nutmeg (Myristica Fragrans), Aloe Vera (Aloe Indica), Vegetable Glycerine, Cellulose Gum, Xanthan Gum, Grapefruit Seed Extract (Citrus Grandis), Phenoxtethanol. 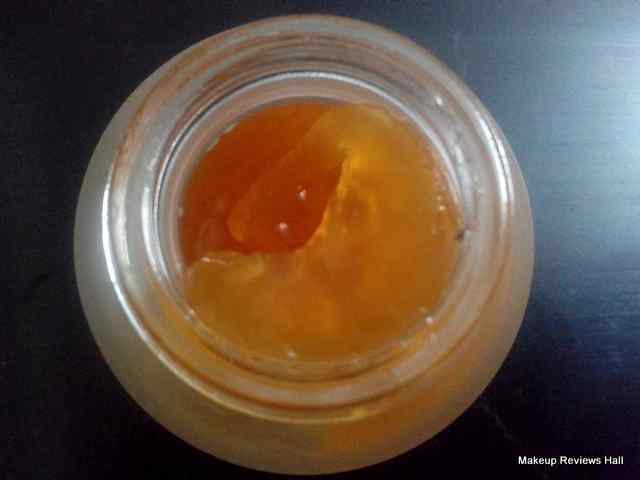 As mentioned above, this gel comes in a beautiful cute jar which is transparent, appears bit frosty with a thick orange brownish gel inside. The gel inside is thick, sticky and smells truly of tea tree oil. I think tea tree oil, one of the best anti acne oil is used as the main ingredient in this gel. 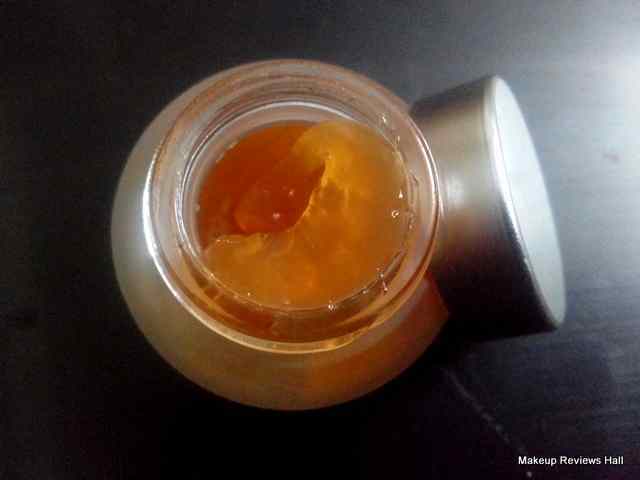 The quantity of the gel is average, however it will easily last for more than a month since a tiny droplet of it is required to spread on the entire face. The gel gives a cooling effect immediately on application but feels sticky at first but gets absorbed in few seconds on rubbing gently. Recently when I was facing a little more zits and acne than normal it was then I started using this gel applying before sleeping and left in overnight for it to work all throughout the night. I used a gentle cleanser wash followed with this Iraya Anti Acne Gel. As a result I got a clean looking matte skin in the morning without any feel of greasiness. However this gel didn't do much than this.I expected it to work as a miracle treatment on my acne and pimples specially because of tea tree oil in it and secondly because of its claims as a miracle treatment . But after using this gel on my acne for about 2 weeks leaving it overnight I realized this gel do control the upcoming acne and pimples keeping them at bay but hardly do much for the existing ones. You can see the difference in the reduction in the size and occurrence of acne but one needs to be patient for this. I personally didn't feel any noticeable difference in my acne and pimples. It was only that skin looked less oily with a matte finish somewhat but I am quite shocked with the results because I expected a lot from this gel specially because it contains tea tree oil which has always worked wonderfully on my acne prone skin. Though I didn't feel any kind of allergy or reaction on using this gel rather it worked nicely as a moisturizer and a pre base under foundation making flawless blending of the foundation but that's not how it could satisfy itself as an anti acne gel. This Iraya gel didn't work on my acne prone skin but one can try this on their skin since results differ from skin to skin. Comes in cute travel friendly jar packaging. Tiny quantity required to cover entire face. Makes a perfect moisturizer and a per base. Give oil free matte finish. No noticeable in difference in reduction of acne and pimples. Needs to be used regularly for long period to feel the difference.